The Hawker Hind was a light bomber designed by Sydney Camm Hawker Aircraft Limited and was introduced into RAF service in 1935 as a stop-gap design until a suitable mono-plane design aircraft could be produced. The Hawker Hind Bomber was withdrawn from front-line RAF bomber squadrons in 1937 and was replaced by the Fairey Battle and Bristol Blenheim. The Hawker Hind remained in service as an advanced trainer with the RAF until the end of WW2. Although a traditional biplane design, the Hawker Hind bomber utilised a tubular steel airframe instead of wood as used in earlier biplane designs. Production of the Hawker Hind Bomber commenced in 1935 and when production ended in 1938 Hawker Aircraft Limited had produced a total of 528 aircraft. The RAF never used the Hawker Hind as a bomber during WW2 but others did, the Persian Air Force (now Iran) used it's 35 Hawker Hinds against British and Soviet forces, the Yugoslav Air Force used it's three hinds against German and Italian forces and the South African Air Force used it's Hawker Hind Bombers against Italian forces in Kenya. It is of note that the Afghan Air Force was the last Air Force to operate the Hawker Hind Bomber, they purchased 28 Hawker Hinds in 1938, the last of which was withdrawn from service in 1957, the Hawker Hind Bomber pictured on this page was one of these Afghan Air Force Hinds, the aircraft was recovered to the UK and restored, it now forms part of the superb Shuttleworth Collection. 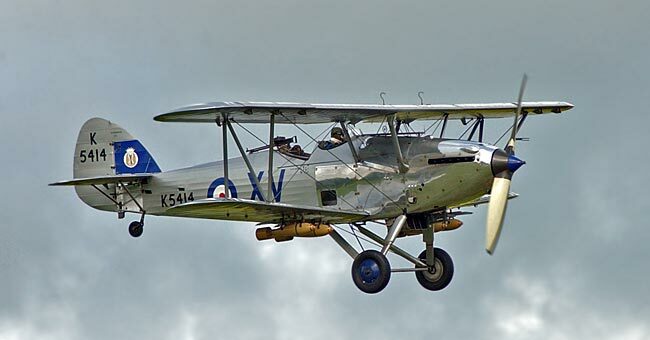 This picture of Hawker Hind is Copyright © June 2014 Siteseen Ltd. We only authorise non-commercial picture use and particularly encourage their use for educational purposes. This Hawker Hind picture is not in the Public Domain. 3) Use of this Hawker Hind picture, or any of our pictures on websites re-distributing copyright free material is strictly prohibited.